The Big England Trip/Tour of summer 2018. *long post warning*. This is going to be long. Did you see the warning, there? I think I made myself clear. The short version is that I had an amazing/wonderful time, and I was treated far too well. I’ll attempt to make this quite detailed and apologies beforehand for leaving some of the wonderful people I met out below. I’m quite jet lagged (and we’ll agree to blame any misspellings or typos on that the lag too, okay?) at the writing of this. If this reads as name-droppy, well, you’ll have to deal with it. I left at 6pm Thursday night and landed, with the magic of time zones (no magic: I did not sleep for more than a few minutes on the plane), at 8:30 am Friday morning at Gatwick airport. The customs agent was friendly though laughed manically in the course of our brief interview when asked what kind of books I wrote. With help from people in orange vests who tolerated my travel patheticness, I ventured from Gatwick to Victoria Station, then a quick tube ride to St. Pancras station where I met my editor and head publicist at Titan Books, Gary Budden and Lydia Gittins. Gary and Lydia are, quite simply, the best. You might be tied with them, maybe, but not better. I think Lydia might have been a bit weary upon first meeting me and seeing who or what it was exactly she was going to have to keep alive in England. I won’t spoil the ending as to whether she succeeded or not. After my first of many meals with eggs and mushrooms, the three of us jumped on a train to Derby for the Edge Lit convention, run by Alex Davis, another very kind man; the one responsible for my plane ticket and the start of this tour. I checked into my hotel to take a nap for a few hours (mainly because I’d been up for about 30 hours straight). The electricity in my room didn’t work and no phone to call the front desk, but I was too tired to care. Upon waking, washing up in the dark was difficult but I sally forthed. Or something. (Yes, Gary and Lydia later informed me of a card slot on the wall in which tired people are supposed to place their hotel room key card. For the rest of the week, I enjoyed the thrill of being responsible for my own electricity). Post-nap, we hit a pub built in 1590. Humans in 1590 were not my height apparently and I met some more folks including Paul Kane (who I’d known online for a while) and Marie O’Regan, editor of a forthcoming Titan anthology and she interviewed me at Edge Lit. From there, my first proper British curry restaurant. It turned out to be the only time I had curry the whole week! Saturday I was busy at the convention participating in two panels, a workshop, and a guest of honor interview. Everyone was very accommodating and friendly. Squeezed between the festivities was lunch with Craig Wallwork (author of The Sound of Loneliness), a friend I’ve known online for quite some time. Wonderful to meet him in person. After the hard work of conventioning, Gary, Lydia and I had a nice dinner followed by a night out at the pub. Highlights including hanging out with and chatting to Priya Sharma and Georgina Bruce, and the lowlight was the monkey-on-the-advert beer I talked Gary into drinking with me. Again, we sally forthed. Sunday/Monday Lydia and I arrived in Newcastle about mid-afternoon. I was able to properly turn on the electricity in my hotel room, so I had that going for me. We took a quick jaunt east to South Shields where my maternal grandmother was born (Vera died when my mother was 14 so I never knew her). A visit to ancestral land! It was a cool little beach town with ruins, lighthouses, sand, water, a carnival, and a row of curry restaurants followed by a row of Italian restaurants. We chose the middle eastern one in between. Monday Lydia and I explored Newcastle and we were treated to a proper British downpour. I would’ve been disappointed if I didn’t get any rain on the trip. We went to the Newcastle football club stadium so I could pick up a few gifts, then a museum, and thanks to a suggestion from a kind follower on Twitter, we found the vampire rabbit of Amen Corner. No, really. Picture included below. Then, despite a friend’s protests that it was a very small castle, we went to the Newcastle castle. That’s a lot of castle in one sentence. Despite it’s apparent lack of size, I thought it was fascinating. And I only hit my head once. That night, Mark Morris interviewed me at Waterstones. We had a nice crowd and only “northern” accent that was impenetrable to me belonged to a nice young woman with a Geordie accent, and we had an existential disagreement over the pronunciation of the letter ‘a’. Post event I had a lovely dinner and conversation with Mark, Lydia, Neil Snowdon, and Stephen Laws. We talked Quatermass, food, books, movies, and had a wonderful evening. This night marked one of the only times I was yelled at, as I used the wrong bathroom (it was a baby changing station, apparently. I mean, I didn’t pee on the baby changing station, there was a fully functional toilet in the room. I’m not a complete monster). Newcastle to Liverpool, not the most direct train route. Lydia expertly navigated us through three or four stops (including one fun get off the train, whoops get back on the train before the doors close on our faces). I hope I don’t sound too touristy, but this pry-my-car-from-my-cold-dead-hands American really enjoyed the rail travel and the scenic countryside. Of all the cities visited, we had the least time to trek around Liverpool because of our arrival time, but what I saw (mostly docks, Albert Dock, I believe) was nice. Pre-Waterstones event Lydia and I shared tea/water with the wildly talented and awesome Priya Sharma and then Priya and I wandered around the store, pointing out each others favorite reads. Lydia expertly lead the book discussion and Q&A during the event. A nice moment in the signing line was the arrival of a young woman who had just minutes before graduated from University. She ran down from the ceremony to the bookstore just to get Cabin signed. How cool is that? Post-Waterstones horror luminary Ramsey Campbell and his wife Jenny graciously treated us to dinner at a tapas restaurant. Another truly wonderful night, if not a bit mischievous as Ramsey repeatedly beat me in a numbers game called ‘nim,’ and exposed my lack of guess-the-movie-this-line-is-from knowledge when it comes to Hitchcock films. I had my revenge by telling the table about the three times I’ve swallowed live goldfish. Debonair, I am. Up and out early on a train(s) to Bristol. The blue city (cabs were blue, they make Bristol blue glass as well) was beautiful. I was totally taken and would love to go back to explore more. We had a bit more time to explore old town, the river walkways, and even a grassy park. At the park Adam Nevill appeared, or apparated. We dodged bicycles and had a brief chat before agreeing to meet at a pub before our Foyles bookstore event. Then Adam disapparated. He needs to show me that trick. Pre-event and and during the event Adam, Lydia, and I had a long conversation and publishing and horror. I’m a big admirer of Adam’s work and it was a real treat to get to spend some time in the real world with him. Post-event we (Gareth Powell, Damien Sayell (he of the band The St. Pierre Snake Invasion), Tim and Tracy Lebbon, Adam, Lydia, me) attempted dinner at a pub that claimed to be still serving food. That claim lasted as long as it took to order drinks. I was then treated to a traditional dinner of ale and crisps. Worked for me. Again, another fabulous evening. And maybe it was the ale and not enough crisps but I found Damien’s story behind the name of his band was more than little moving. The night ended with Lydia and I managing to pry some room service down to the hotel lobby at 11:45. The ham and cheese sandwich did the job, though I think it was why I had crazy Bristol nightmares that night. Getting a text at 4 am from my math department head about my upcoming academic year schedule only added to the nightmare fuel. London! The trip up from Bristol was a straight shot and relatively short. The cab ride from the station to the hotel room might’ve been longer… But we made it and after a dash in the tube, Lydia left me in the capable hands of Andrew Falkous and Julia Ruzicka (2/3rds of one of my favorite bands, Future of the Left). We had a quick lunch and then Andy and I speed walked through central London seeing almost all of the big sites, but no, we did not see the Jeff Goldblum statue. Alas. Responsible-for-my-conduct host that Andy is, he brought me back in time to a busy pub close to the event at Blackwells. We reconnected with Lydia, Gary, and a whole bunch more of the Titan Books crew. The event itself was bittersweet as it was my last one for the week, but I had a really enjoyable conversation with Jason Arnopp. After the event was a lot of fun in the darkest of all pubs. There were many laughs, a story about a guy blowing up his friend’s car on purpose, and Titan Books gave me a going away present/care-package including a whistle (bunch of whistle blowing chaps in England, there are) which brought me to ugly American tears, at least it did on the inside. The next morning Lydia and I went to Forbidden Planet where I signed a whole slew of books, and then before I knew it the week was over and I was in the airport waiting for my delayed plane. Thank you everyone who came out to say hi, buy a book, or have a drink this week. Special thanks to Alex Davis for flying me out and having me as guest at Edge Lit. Super special thanks to Gary Budden for being a great guy and the editor with the best taste in music in the biz (sorry again about that Last Mango in Paris ale). And Superest Specialest thanks to Lydia Gittins for being so patient and kind in getting me from place to place while indulging in my touristy whims. Team Titan Books forever. Stephen is a very nice person. Thank you, Stephen. Apparently my phone needs charging too. 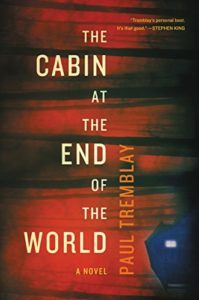 Paul Tremblay's new one, THE CABIN AT THE END OF THE WORLD, comes out in June. You should mark it on your calendar, it's that good. Thought-provoking and terrifying. You don’t need to mess with a calendar if you pre-order the book here or here or here. Books continued to be neat in 2017. (I squeezed in some extra reads this year by listening to audio books while walking the dog. It’s all about time-management, people!) Let’s not waste time and get right to the categories. Thing We Lost in the Fire, Marina Enriquez. This collection was a revelation. Dark, smart, sociopolitical, enthralling, Shirley Jackson-esque in feel. The Changeling, Victor LaValle. A brilliant mash up of parental anxieties (there’s a scene toward the beginning of the novel that is as intense and uncomfortable yet recognizable as any scene I’ve read), life in Trumplandia, and dark fairy tales. Ill Will, Dan Chaon. A maddening and magnificent puzzle-box of a novel. She Said Destroy, Nadia Bulkin. The second collection to crack the top 5. More sociopolitical horror that challenges (and disturbs) without ever being didactic. Mapping the Interior, Stephen Graham Jones. When I first heard that Tor.com would be publishing novellas, I was skeptical. (Why? Why answer in a parenthetical? I’m afraid of new things?) But their books are unflaggingly daring and compelling. Jones’s has been my favorite of the stellar bunch. A very personal story that manages to crawl inside the reader and take root. Mandelbrot the Magnificent by Liz Ziemska, Running by Cara Hoffman, The World to Come by Jim Shepard, The Night Ocean by Paul LaFarge, Landscape with Invisible Hand by M. T. Anderson, Devil’s Day by Andrew Michael Hurley, Manhattan Beach by Jennifer Egan, Paperbacks from Hell by Grady Hendrix. 2666 by Roberto Bolano, Full Dark No Stars by Stephen King, Dead Mountain: The Untold Story of the Diatlov Pass Incident by Donnie Eichar, The North Water by Ian McGuire, The Handmaiden’s Tale by Margaret Atwood. There ya go. There were many more very good books read and you can check out my Goodreads page for the full accounting.